And so to Germany, and the first of the six shows in the country, all in different locations. As with the previous two nights, the show went down extremely well with an appreciative crowd. 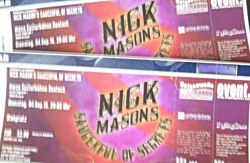 During his initial thanks and welcome to the audience, Nick said "So I hope you know, we are not the Indonesian Roger Waters, the Australian Pink Floyd, or indeed the New Zealand David Gilmour; we are Nick Mason's Saucerful Of Secrets! I'd just like to hope that you'll have as much fun tonight as we are." The set list went unchanged, and we expect this to remain constant throughout the run of concerts. Initial reports are glowing about the performance; the band now travel to Amsterdam for night four.